The fans have spoken! The fires are lit and the gloves are off, but the buffs are on. The latest season of Survivor, Survivor: Cambodia – Second Chance, is kicking off with the one twist most former castaways wish they had: a second chance to play the game. Second chances are the hardest thing to get in the game of Survivor. Losing players regret making certain moves and not everyone is asked back to compete for another go at the million dollars. A second chance is their moment to change their history. And some have worked it to their advantage to win the game (Boston Rob! Parvati! Cochran!). As this season’s crop of fan-voted castaways make their way through the forests of Cambodia, many reveal their regrets from their previous seasons. Kelly Wiglesworth (Survivor: Borneo) remembers being the first ever runner-up and losing to just one vote at the end, Spencer (Survivor: Cagayan) wants to change his playing style to go for the win but make strong relationships, and Abi-Maria (Survivor: Philippines) isn’t going to let her emotions rule her game. It’s a group of money-hungry, smart and devious castaways with something to prove. One word: Perfection! Kelly Wiglesworth (Survivor Borneo), Kelley Wentworth (Survivor: San Juan del Sur), Jeff Varner (Survivor: Australia), Shirin Oskooi (Survivor: Words Apart), Vytas Baskaukas (Survivor: Blood vs. Water), Peih-Gee Law (Survivor: China), Woo Hwang (Survivor: Cagayan), Abi-Maria Gomes (Survivor: Philippines), Terry Deitz (Survivor: Panama) and Spencer Bledsoe (Survivor: Cagayan). 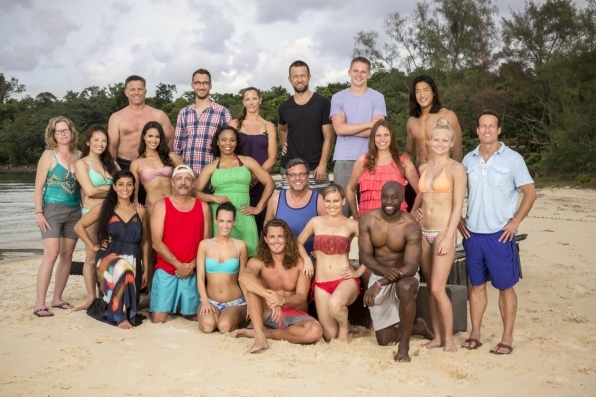 Joe Anglim (Survivor: Worlds Apart), Andrew Savage (Survivor: Pearl Islands), Keith Nale (Survivor: San Juan del Sur), Monica Padilla (Survivor: Samoa), Kimmi Kappenberg (Survivor: Australia), Kass McQuillen (Survivor: Cagayan), Tasha Fox (Survivor: Cagayan), Ciera Eastin (Survivor: Blood vs. Water), Stephen Fishbach (Survivor: Tocantins) and Jeremy Collins (Survivor: San Juan del Sur). The first episode saw the majority of the castaways reflect on their past experiences and how they could change up their game play. Some who played behind-the-scenes roles decided to stand out instead while others kept their mouths shut to not make waves. Spencer, Kelley, Terry, Joe, Kelly and Jeremy are some of the few who early on showed promise in their changing game play. Spencer and Jeremy are making sure they have the alliances to protect themselves. Kelley even took the risks of finding the first hidden immunity idol during the first immunity challenge! Not everyone can learn from their past mistakes. Abi-Maria quickly stood out in her tribe for causing drama with Peih-Gee when her missing bracelet was found in Peih-Gee’s bag. Vytas, on the other hand, was rubbing his tribe mates the wrong way with his flirting tactics and constant yoga moves. Shirin even referred to him as smarmy and Kelley wanted him to just go away. Over at Bayon, Stephen felt out of place in his tribe and couldn’t connect with his more physical male tribe mates. Old habits are hard to die and in the world of Survivor, it’s either sink or swim. You should never ruin a great opportunity like this. After the first vote off of the season at Tribal Council, Vytas from Ta Keo was voted off by a vote of 6-4 (Abi-Maria had the other votes). This jaw-dropping blindside shows that these players are ready to play! Vytas could’ve been a strong asset in the challenges but his actions at camp simply left a bad taste in their mouths. They knew what he was doing by manipulating the women and instead of getting out an easy target like Abi-Maria, they blindsided him and went for the kill. It’s a very smart move this early in the game! Returning players have no qualms about backstabbing each other to win. They have something to prove and they’ll go for it. Whenever a season starts with a shocking blindside, you know it’s going to be just the start. Bring on the betrayals–I’m ready. Previous ArticleTV Throwback Review: Party Down (1x08) "Celebrate Ricky Sargulesh"